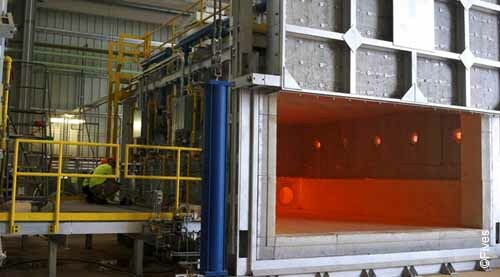 The forging industry today continues to look to improved performance across a wide range of thermal systems. Fives is well positioned to address the needs with an emphasis on improved temperature uniformity and production efficiency. The forging industry continues to be very active as it responds to the quality, production, emissions and efficiency demands of the aerospace, automotive, and energy industries. Transporting oil either via pipeline or rail car is forging and heat treating intensive. This is driving rebuilds and new furnaces spanning car bottom furnaces, rotary forge furnaces (continuous and semi-batch), box forge furnaces, and slot forge furnaces. Fives designs systems ensure temperature uniformity and production efficiency, using various high technologies, regenerative systems, high velocity and recuperative burners. Fives has a world renowned expertise in fuel management systems, providing adapted solutions for the handling of mostly any type of fuel type up to the firing point. To ensure performance, Fives offer specific control systems including Safety PLC-based process control systems. Fives offers a full range of ancillaries systems such as blowers, control valves, and regulators. Fives brings its expertise and services to supply tailor-made solutions and ensure an optimal performance and improved availability of the line, including heating analysis and baseline studies.